After a lengthy email exchange, a friend recently declared, “OK—enough discussion about gear, now let’s talk about fishing,” which naturally led to the next topic: location. It’s true: fly fishers can be pretty gear-obsessed, sometimes at the expense of other very important aspects of angling. So we discussed location for our next outing, and arrived at a tried-and-true spot that we haven’t visited in months. This got me thinking about expanding my fly fishing horizons—geographically, that is. I’m not referring to that lifetime trip that’s far and remote, but rather, just other places that won’t take 48 hours and three flight connections to get to. Many of these places are right here, in North America, and one of the best guides covering that vast geographical expanse has just been released by Stonefly Press: 25 Best National Parks to Fly Fish. 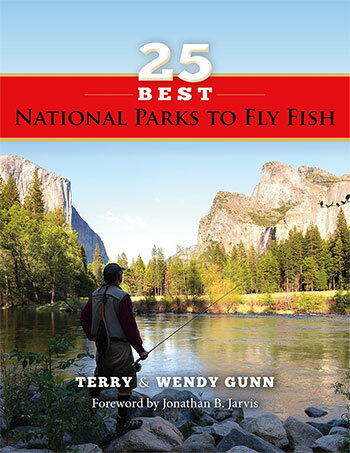 Authors Terry and Wendy Gunn tap into the collective knowledge of some of the most accomplished guides and anglers working the waters both inside and adjoining the nation’s most accessible national parks. Unless you’re an exceptionally well-traveled fisher, just leafing through this guide will make you feel that even some of the closer destinations are exotic. I occasionally had to remind myself that this is a North American guide that I was perusing. From jumping tarpon in the Everglades, to high-sticking for brook trout in the small creeks of the Great Smoky Mountains, and throwing line in the high-alpine lakes of the Rocky Mountains, these authors and contributors share their deep knowledge of each park and the many species that inhabit their waters. Each of the 25 national parks is covered extensively. The book is packed with GIS maps and solid technical information, covering everything from equipment requirements, to terminal tackle set up, hatch information, hot spots, and, of course, recommended flies. The detailed species discussions, fishing tips/recommendations and photography are all top calibre—these three items alone make for a solid reference guide. What puts it over the top, however, is the same element that makes all good fishing books standouts: it will encourage you to seek out a previously unvisited spot, and make plans to go there and fish. 25 Best National Parks to Fly Fish celebrates the phenomenal fly-fishing opportunities in the National Park System. For anyone—in the US or elsewhere—aiming to expand their fishing horizons, this book is a must have.